A publicity card showing a painting by Roy Grinnell published in 1992. On the reverse of the card are printed the full details of the depicted action. As the German army crossed the border into Poland in September 1939 precipitating WWII, Gnys was a fighter pilot flying antiquated PZL aircraft against the modern might of the Luftwaffe. 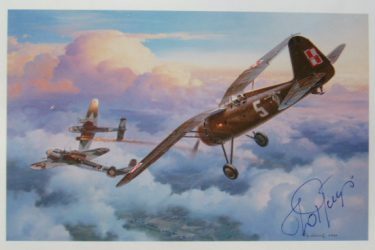 He is credited with the first ‘kill’ of WWII and after the collapse of Poland he escaped first to France, flying with the Armee de l’Air and then to England where he joined the RAF in time for the Battle of Britain. He flew with 302 Squadron and later commanded 317 Squadron until he was shot down over France after D-Day. He escaped yet again and returned to England. After the war he emigrated to Canada. Gnys’s memoir ‘First Kill’ is also available from Spitfire Books, (price £15), please enquire.